I'd go with a Gennaker/Reacher/Drifter/Code zero rather than an Asym. Excellent advice. Our customers, some of whom have reported firsthand on this site, have been very content with their choice of a CLASS (Cruisers Light Air Sail Solution) and will not be going back to using a cruising spinnaker. Flying the sail from a foil-less furler is much easier than using a sock. - buy a second spinnaker pole. With two poles you will be disqualified for racing but it will completely stabilize the spinnaker for a lovely ride. Some boats come with this equipped as standard like the Amel's. The question is really whether it's better to save some money buying a generic spinnaker built to a set of stock dimension or to have a spinnaker custom designed and built for a few to several hundred dollars more. Sometimes a stock size works out and sometimes it doesn't. The reason you see some lightly used assym's for sale is that people use them and find them quite unmanageable. Last week a gentleman with a Hunter 40 something inquired about spinnakers. We looked at the stock size spinnakers and found that one with an appropriate luff length would have a girth close to 200% of his J measurement. We'd normally want to see that number around 165% for a cruising spinnaker. Another drawback of the stock size spinnakers is that they are often built with 1.5oz cloth to keep costs down. 1.5 is too heavy for really light conditions. 0.75oz cloth is more expensive which I know is counter intuitive but that's the way nylon is priced. 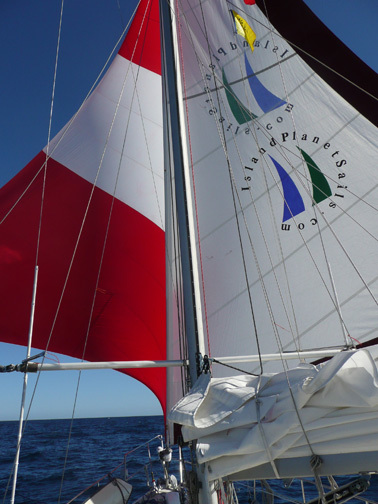 About 3 years ago we had a customer who needed a sail quickly (delivered to Puerto Vallarta in 10 days) and the only choice we had was to offer him a stock spinnaker. It actually fit the boat pretty nicely and he had a great time crossing the Pacific with it. Here's a photo. We have an Amel with the twin pole arrangement, but there's a lot more to it than just a second pole. There's a bracket installed between the shrouds that a strut attaches to from the side of the mast. Then the pole attaches to the strut. The pole itself is a standard size pole but the effective length is much longer due to the strut. You also have the ability to articulate the pole from the end of that strut so the spinnaker pole end can go in position further aft than a pole flown from the forward face of the mast since those are restrained by the forward lowers in how far back they go. Your boat is one of my favorites. If we ever sold our Amel, we'd be looking at boats like yours. Yes the Amel has it pretty well worked out, but you can get most of the advantages with a regular 2nd pole to the mast attachment too (2nd car or eye). It is more work but once set it will be pretty cool. We have a Gennaker on a Facnor continuous furler and an Asym with a sock on our Beneteau 49. On this large a boat, the sock gets pretty unwieldy and I've had trouble getting it out of the sock due to jams. By adding a swivel atop the existing Facnor and a torque rope, we can convert to a furling spinnaker and hopefully make its handling easier for under $1,000. Juan at Maui Pro Sailing was very helpful. I've flown the asymmetrical from a pole on an overnight nearly dead downwind sail from Boston to Maine at a comfortable 10 kt with a nice stable set, so recommend this if the run is long enough to make up for the extra work involved. If you set up your own anti-torque rope, check out the Colligo line clamp. I have a client near Puerto Vallarta we built a couple of sails for and we needed to shorten the existing anti-torque rope. Stuff that's been in use is hard to splice so we sent him a line clamp which works like a charm. You can fine tune your rope as needed. Just have whoever supplies the line install your top thimble and the bottom you can do on the boat. Has anyone tried a parachute for downwind? Surplus 28ft chute for $250 seems worth a try, can it works as sea anchor too? With water being much denser than air, what do you think? Asymmetric or symmetric? Asymmetric's are usually rigged to the bowsprit or anchor roller. With my symmetric I have done this a few times when I have been to lazy to get the pole out. It kind of works ok for me if I drop the main and run the sheet out to the end of the boom downwind. On an reach if you pull the guy just tight enough to hold the spinnaker onto the forestay and rig a downhaul to stop it riding up the stay it sort of works as well. Hard on a furled sail though, those ATN things might work ok for this. I have heard you can gybe easily with a setup like this, setting the sheet/guys to just the right length. I can't say I have tried it. Worth playing about with in light airs. My new boat is set up like this, looking forward to playing with it. Islandplanet: Thank you for the Colligo clamp info. It is the exact solution I was looking for- we will leave extra length so the bowsprit that we'll fabricate this summer and fly it off the existing bow tip then. I have been living on this forum for the past few days as we outfit our boat for two+ years of living aboard and I have never seen so many good ideas presented so well in all areas of sailing- solar panels, batteries and their controllers, sails and handling, anchors- on and on, my questions have had many answers. Thanks to all!! !